There are many minor repair jobs in the home that can be tackled by the average homeowner – but removing acoustic ceilings is not one of them. It’s arduous, it can lead to an unsatisfactory result, and it can even be dangerous! If this type of ceiling is prominent throughout your Mississauga home and you are looking to have it removed, call The Ceiling Specialists to do it for you! At The Ceiling Specialists, dealing with all sorts of ceiling issues is all we do. We’ve got plenty of experience removing acoustic ceilings and revealing the more esthetically appealing surface beneath. The sprayed-on stucco that makes up acoustic ceilings is extremely stubborn and very difficult to remove. Without the proper technique, tools, and know-how, it can prove to be an incredibly labour-intensive job that can risk leaving a less than desirable result. Scraping the material off is very taxing, and the mess that it leaves behind can be overwhelming if the right preparations are not made. Last, but certainly not least, it could release asbestos in the air if measures aren’t taken to test the material first. While not all popcorn ceilings have asbestos, it’s certainly a possibility and not something that you should take risks with. Asbestos may not be dangerous if left alone, but if disturbed, it can release tiny fibres into the air to be breathed in by anyone in the vicinity. Inhaled asbestos can cause serious health issues with the lungs and respiratory tract, which is what makes dealing with asbestos so dangerous. In a situation like this, you absolutely need The Ceiling Specialists to come in and inspect your ceiling for you before any scraping of the material should commence. At The Ceiling Specialists, we don’t rush the process of removing acoustic ceiling material, but we’re also efficient and prompt at the same time. We first begin by adequately prepping the site and blocking off the area in question in order to keep the mess confined. We ensure that a path is made from the room being worked on to the vehicle truck while all other spaces are blocked off as well. Once the site is ready, we spray the ceiling with warm water to soften the material and make it easier to scrape it off. We then use special tools to completely eliminate the material. Such a process typically leave divots and scrape marks behind, and as such, we smooth out the surface with a finishing material to create a seamless end result that you’ll be extremely pleased with! 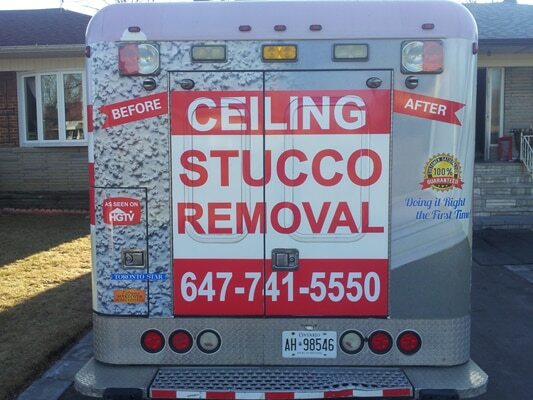 When it’s time to have your acoustic ceiling removed from your Mississauga home, call The CEILING SPECIALISTS! We offer free assessments to educate you on the process and answer your questions. 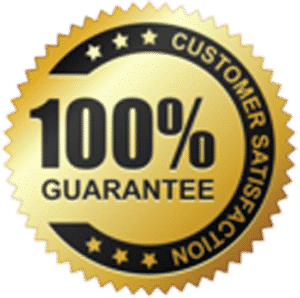 We stand by our quotes and promise not to hit you with any hidden fees when all is said and done. 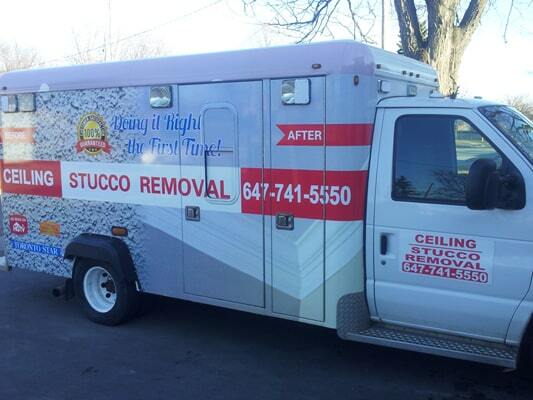 Call Us at 416-741-5550 to request your free quote today!